Bringing a pot of water to a boil. Place eggs in boiling water and cover the pot, reducing to simmer for 10 minutes. While the eggs are cooking, start rinsing the quinoa in a strainer. Add quinoa into another pot with 3/4 cup water. Bring water to a boil, then cover quinoa, set to low heat, and let quinoa cook for 10 minutes. When eggs are done cooking, rinse them under cold water and peel. 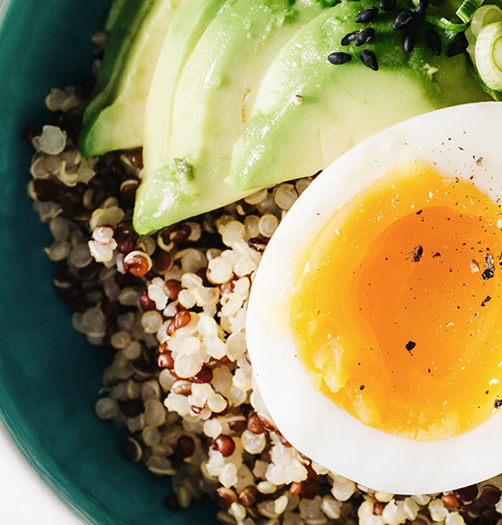 Prepare your breakfast bowl by adding a quarter cup quinoa, half of the avocado thinly sliced and half the pesto. Slice eggs in half and add to each bowl.